When the application calls for exceptional strength filmoplast SH is the answer. 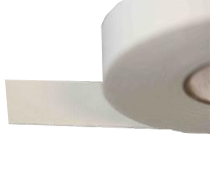 Made from an very fine threaded white linen fabric this tape is coated with a high tack acrylic adhesive that bonds well to a variety of surfaces. Professional picture framers use filmoplast SH to hinge or “book” the window mat to the backboard keeping the two in perfect registration. filmoplast SH can also be used in conjunction with our filmoplast P 90 to create a high strength art hinge. In this application the filmoplast SH is used as the cross piece attached to the backing board and filmoplast P 90 holds the art.